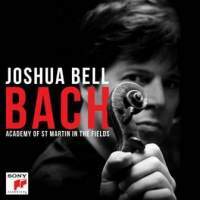 Joshua Bell’s collection of works for violin by Bach includes the Air from Bach’s Third Orchestral Suite, and orchestrations by Julian Milone of both Mendelssohn’s accompaniment to the Chaconne from the Second Partita for Solo Violin and of Robert Schumann’s accompaniment of the “Gavotte en Rondeau” from the Third Partita, as well as the two canonical violin concertos. The program opens with those two concertos, in performances seemingly influenced by the rapid tempos and bristly articulation of the period instrument movement, but exhibiting the full bloom of modern sonorities. In fact, Bell’s silvery, slender tone conveys a wealth of nuances, even in the first movement. The second elicits from him an almost Romantic dynamic subtlety, which many listeners nowadays may feel doesn’t advance the musical argument—though it doesn’t impede the movement’s progress, either. The orchestra begins the last movement with striking gestures, and Bell plays the sprightly solo part vivaciously. Bell and the ensemble emphasize the chunkiness of the theme of the Second Concerto’s first movement, but he keeps the rhythm chugging forward with occasional ornamentation to boost the energy. His playing of the slow movement seems at the same time more sinuous and more natural than that in the corresponding movement of the First Concerto. The harpsichord plays discreetly throughout the movement (as it does elsewhere). The finale sounds energetic, although some listeners may strain to find a joie de vivre that lifts it above the commonplace. Bell takes 13:26 in the Chaconne—the orchestral accompaniment that Julius Milone has created for it out of Mendelssohn’s materials hasn’t weighted it down. Bell isn’t apologetic in the notes about Mendelssohn’s contribution—or about Milone’s, suggesting that it simply provides a “unique perspective.” In this opinion, he stands opposed to those who consider accompaniments even by such eminent composers as Mendelssohn and Schumann disfiguring excrescences. At times, as in the arpeggiated section, listeners may find themselves listening more to what Mendelssohn has to contribute than to what Bell does. Pulling together Baroque, the Romantic, and the violinistic doesn’t seem like a particularly easy synthesis, but Bell will seem at least to some listeners to have compounded a genial sort of amalgam from them. The Air from the Third Orchestral Suite doesn’t appear here in its later guise as a solo for the G-string; Bach’s interwoven accompaniment to the melody (felicitously graced by Bell) accordingly receives generous representation. The program concludes with an almost cheeky rendition of the “Gavotte en Rondeau,” a reading some will feel to be richer in characterization than anything that precedes it. Bell’s take on Bach, with all the bells (oops) and whistles that the arrangements provide, can’t be compared directly with other versions of the composer’s works by contemporary celebrities; and it’s likely that audiences will either love it or hate it. Does it provide, as the notes hint, a good introduction to Bach? Is it sufficiently homogeneous stylistically? Inquiring minds want to know. At least it’s not offensive or bland. Recommended to collectors not put off by the headnote.